​The cake’s symbolism of fertility has endured many generations. Some believe the top tier of the cake represents the newly married couple, the bottom layer represents their families and foundation, and the layers in between signify how many children the couple with have. Makes you wonder what could happen with cupcakes! In Roman times the wedding guests would take pieces of the broken cake for themselves as a symbol of fertility and good fortune. In Medieval times, the guests would bring individual cakes to the wedding and then share in them with the happy couple, again believing that fertility and good fortune would bestow them. Throughout the recorded history of weddings, the wedding cake has been a symbol of love and fertility for anyone receiving a piece as a gift - with the strongest myth being if you slept with a piece of the wedding cake under your pillow you would dream of your future marriage partner. This underlies the tradition that we still follow today of the giving of pieces of wedding cake. In today's society, in line with tradition, the top tier of the wedding cake is kept for use by the newly married couple on a future happy occasion. 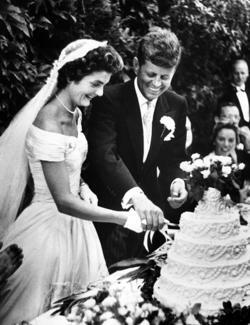 Whatever occasion they choose to use the top tier of their cake, it is seen as a reminder of one of the happiest days of both of their lives. Often this is to celebrate their first wedding anniversary with their families and close friends. 1. Insert a thin, sharp or serrated knife into cake, keeping point down and handle up, as shown in diagram. 2. Slice, pulling knife toward you. If frosting sticks, dip knife in hot water or wipe with damp paper towel after cutting each slice. 3. Cut vertically through bottom layer at edge of second layer as indicated by dotted line 1; then cut into wedges as indicated by dotted line 2. 4. For middle layer, follow same procedure by cutting vertically through second layer at edge of top layer as indicated by dotted line 3; then cut into wedges as indicated by dotted line 4. 5. Return to bottom layer and cut along dotted line 5; cut into wedges as indicated by dotted line 6. 6. Separate remaining layers (traditionally, the top layer is frozen, then wrapped securely and placed back in the freezer for the couple’s first anniversary); cut as desired. The correct way for the couple to cut the wedding cake is for the groom to place his right hand over the bride's hand for them to slide the knife into and through a section of the bottom layer of the cake. This is seen as the first task that the couple will have performed together and symbolizes unity for their forthcoming married life. The first slice of the wedding cake is placed onto a plate and the knife is again used to cut this slice into two smaller pieces. First the groom feeds a piece to the bride, and then she reciprocates by feeding a piece to him. The significance of this is the couple's public declaration of a mutual commitment to always provide for one another. The tradition of having cake at the wedding is centuries old, but it may surprise you to know, the tradition has greatly evolved over the years.